I’m trying to reach when I pick these. Some will be a little more obvious but hopefully a few will be eye openers. If I hit on a couple of these guys it would be great. I expect all of them to be winners but we’ll evaluate them later in the year! UPDATE: So much for Tebow getting a shot at starting… looks like he will be relegated to the bench. Too bad for Tim, because his fantasy value is high like Vick in my opinion. Thanks for checking out the site, but I believe that is exactly what makes a sleeper. And I use the rankings from ESPN because they are so poular. Also remember, these came out over a month ago, some have definitely come up the ranking boards since then. I will be doing a part II sleeper list, let me know what you think when I post it later. LOL, credibility? 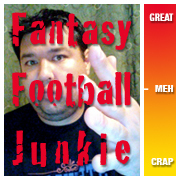 I’m a stay at home Dad who happens to know a lot about fantasy football. Not sure if that has earned me much cred yet but I’m glad you came by the site and posted. You have to remember that I posted this before the first preseason game, before Kyle Orton reasserted himself the starter, and before the whole twitter battle with ESPN’s Merrill Hoge. I’m not saying he’s the next Joe Montana people, just look at his numbers from when he was a starter in 2010. Weeks 15-17 he amassed a total of 71 points! That’s more than Vick. More than Aaron Rodgers. More than Tom Brady. And more than Peytom, Rivers and Brees. So to completely write the kid off is lunacy. His numbers as a starter speak volumes. If he’s playing, he will be fantasy relevant. PERIOD.